Mark Zuckerberg: Native apps for iOS and Android are the future! Information overload is one of the main challenges for corporate communication of SMEs. It raises the question of how companies can successfully stand out from competitors in a sea of offers and information. The main drivers of this development are social networks and mobile Internet, which are constantly available to us via smartphones and tablets. Especially apps that run on these devices and provide us with all this information. But even leading companies have missed this trend for a long time. An interesting example is Facebook. Historically, they come from the development of desktop solutions in the form of the Facebook website. As mobile Internet increasingly gained importance, the decision was made about 2 years ago to focus on HTML5 technology. The intended advantage of this solution was the capability to present Facebook on different devices such as smartphones and tablets from different manufacturers based on the same platform. The recently updated Facebook app for iOS already proves that this is the right way. The number of feeds read on the new native Facebook app have already doubled. The topic of “mobile” was previously often considered as the vulnerability of Facebook. 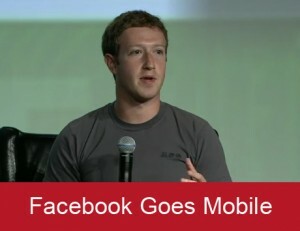 Now Mark Zuckerberg made his first public appearance after the IPO to provide clarity in the strategic direction: Facebook goes mobile. On one hand Facebook will be a more effective platform for SMEs to connect with with their customers. At the same time, the new orientation of Facebook will make a further contribution to information overload. Managing consulting firm say when GmbH supports its customers with concepts for strategic communications and value-based branding, in order to secure a competitive advantage in this flood of offers and information. Watch full interview video with Mark Zuckerberg below or on Techcrunch, it offers very interesting insights into the strategy of Facebook.